The definition of "turning your world upside down"
It's not a secret to my real-life friends but on my blog (which usually has a minimum of personally identifiable information on it) this has not yet been revealed: for the last 8-10 months I've been preparing for the arrival of a new roommate. I wasn't sure who this roommate would be but I knew approximately when I could expect to meet him or her. 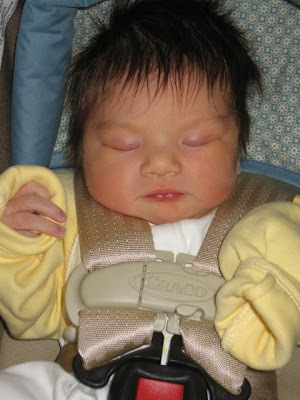 Finally the day passed and last week I was there when she arrived: my new daughter. It was an incredibly odd feeling when she was born. Despite my initial aversion I watched as the head came out and seemingly 20 hands reached down to clean her face, but when they pulled her out and said "It's a girl!" the moment achieved its total impact on me and I cried a little as my old world melted away. The doctor who was delivering her offered for me to cut the cord but I don't do that sort of thing and so he did it, quickly and efficiently, as he did everything. I had only met this man a couple hours before but I could see his true professionalism as he went about doing his thing. Meanwhile a veritable pit-crew of people descended on the little girl as they cleaned her up and checked her out. Within minutes she was on the weigh-scale and someone was saying "Dad, do you have a camera?" It took me a few seconds to realize they were talking to ME. But it turns out I DID have a camera and so I ran over and snapped a couple pics of my new most important priority. Then they handed the girl to my wife (Mom!) so the two could have skin-to-skin contact (which helps the baby regulate her temperature and breathing). Since then life has been a blur. But holding this tiny little person in my hands makes me realize that I can create something beautiful; that I have an opportunity unlike any other. Many people want to leave the world a better place than how they found it; this is my chance. I'd like to take this opportunity to thank the good people at the North York General Hospital. They were very professional and pleasant to deal with and even though my wife's ob/gyn wasn't there (at NYGH you get whichever ob/gyn is on call) the doctor on call was extremely good and we have no complaints about the people at all. Usually hospital visits are characterized by waiting around for surly people to grudgingly treat you. 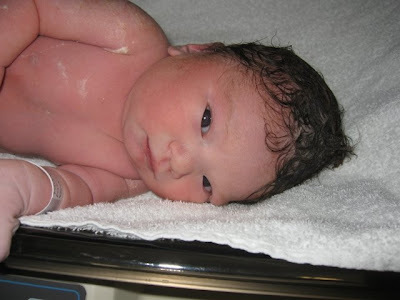 At NYGH, in the labour/delivery and mom/baby units all the staff were pleasant and helpful and professional. Giving birth is a wonderful but extremely stressful occasion but these people made it much easier.